Military members and their spouses save 5% off this cruise. This offer does not apply to certain extensions. Click here for eligible departures. Your journey into wonder begins at Giza with a two night special stay at your iconic hotel. You’ll be able to soak up the magnificent view of the Great Pyramids right from your balcony. Please book flights to arrive by 2pm. Cross to the West Bank of the Nile and be astounded by the well-preserved, colourful hieroglyphics adorning the tombs in the Valley of the Kings. See the impressive monument to Queen Hatshepsut, then admire the well-preserved temple of Ramses III. Return to Luxor and embark on your luxurious private charter on board the boutique Sanctuary Sun Boat III and settle into your elegantly appointed cabin. Late afternoon tour the vast open-air temple complex of Karnak and be awed by the enormity of the pillars as you walk through the impressive Hypostyle Hall. Be ensconced in luxury during your Special Stay and admire the sweeping views over the Nile from the comfort of your balcony. Discover the Pyramids, tombs and temples of Egypt on an 11 day tour. 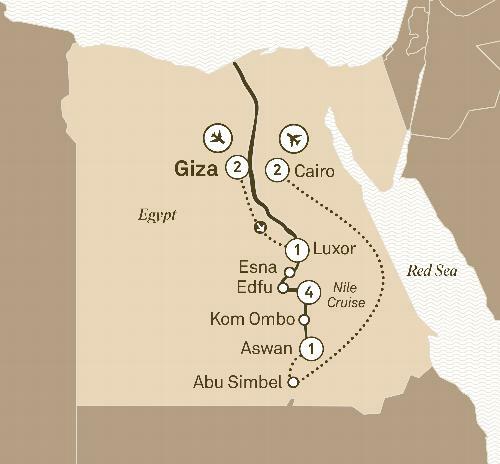 Cruise along the Nile in luxury, visit the Valley of the Kings and the Egyptian Museum.